Another week of training has come and gone, with a bit less mileage than week 1. I ran in a local race on the weekend, which was a great test of my race pace. I'm feeling great so far and I'm looking forward to higher mileage again next week. I also need to work on adding in more cross training! I split this run in half- 2.5 miles in the morning at 10:00 pace, and 1.8 miles in the evening at 9:26 pace. Dan and I ran the first half of the Run Around the Square course to get ready for Saturday's race. It was super hot and humid out at night, so I'm glad I switched to morning running! The goal for today's workout was to run steady for the first three miles, then gradually pick up the pace. I started out a lot faster than I planned (thanks to a mostly downhill first half) with an average of ~9:15 for the first three miles. I ran through Pitt's campus and had to stop on Roberto Clemente Drive and visit the old Forbes Field wall (above) to wish Roberto a Happy 81st Birthday! Then, I ran through Shadyside and finished by running uphill for the last two miles with a surprising 8:45 final mile. It felt tough, but I kept trying to slow my paces and my legs just wanted to go! The Run Club did Hump Day hills, so Dan and I joined in and completed two repeats up Shady Ave. We both took it easy so we wouldn't be too tired out for our race, but it was a great way to work different muscles and stretch it out! When I got home, I drank some Tart Cherry juice and chilled out (literally) in an ice bath. Recovery, people! Just a little run with Dan to stretch out our legs for the race. 2 miles with some striders thrown in there. Perfect day for a race! The morning was really cool, and started to warm up a bit by the start. Mile 1 was with Dan, around 9:30 pace. After the first mile, there are lots of hills until about 2.25 miles (which I loved) so I picked up the pace and passed people when I could. After the final water stop, it was straight downhill to the finish. I pushed as hard as I could and picked up some more places and time. Dan ended up coming in right after me at 28:17, which is an almost 2 minute PR! Super proud of him. The weather felt absolutely amazing this morning for my long run, so it was really hard to keep my pace slow. I ran at North Park which is always packed full of runners/walkers/bikers/rollerbladers. I saw a few local runners (including Steff!) which is always motivating. I tried to keep my pace slow, but let myself finish fast with my final two miles at 8:45 and 8:20. Great run overall! All of my runs went really well, and my legs have felt surprisingly fresh every day. I can feel myself getting stronger and faster with each run which is a really exciting feeling. 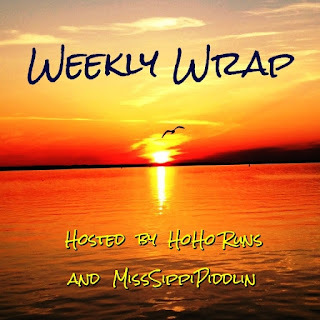 Linking up with HoHo Runs and MissSippiPiddlin for their Weekly Wrap linkup! How is the weather where you live? Hopefully getting cooler! Nice week of runs! I'm excited that both you & Dan had such a great race! Congrats! The mornings this weekend were really perfect for running. I wish the cool mornings would stay around forever. Very nice week of training! It's nice to see that it is going so well for you! Seems like training is going well. While I don't do ice baths, getting my feet in cold water after a run feels pretty good. It's definitely not fun but it always helps a ton! Looks like a great week of training! I love your pics and graphics! Where is the towpath half marathon? Great week of training, Gretch! And congrats to Dan on his PR! Wow, you had a great week with fast paces and strong legs. I just love that your run club calls it Hump Day Hills! I need to incorporate that. I'm really enjoying the graphics you've put in place recently. Congrats on a great 5k race time and to Dan for a 2 minute PR. That's awesome! I'm hoping some of your cool mornings rub off on me very soon! Thanks for linking up with us this week. I really appreciate it! Oh please, oh please send us some cool weather! Your running looks to be going just great! It is so awesome you two run together and congratulations on the 5k! I'm curious what does the tart cherry juice do? Thank you so much for linking up with us this week we sure appreciate you! I wish I could! Tart cherry juice helps me recover better from runs..it prevents cramping and muscle soreness. My mom actually recommended it to me because she has arthritis and hasn't had any flairups since she started drinking this! It's amazing! I love the graphics! Sounds like a great week to me! Every week you get a little stronger is a great thing! Sounds like a solid week of training! Finally starting to get cooler here!